Post subject: C layer for KolibriOS. A GSoC project. Summary of the project: Building a C layer for KolibriOS, so that we can get more developers and port more code to KolibriOS more easily. ​22 april ­ 30 May : Writing wrappers for main libraries and example program: box_lib (support for other components), proc_lib, libini, libio, http, rasterworks, kmenu. 20 June 19:00 UTC Mentors and students can begin submitting mid­term evaluations. 27 june ­ 15 Aug: Working with a mentor on another task: the beginning of work on the porting of PolarSSL, or rewrite uPDF on newlib, and to further improve program. Let start working on the project! 1.Сейчас не все системные функции имеют вызовы в тулчейне gcc. 2.Обертки для вызовов нужны для всех библиотек в /sys/lib, и возможно некоторых многообещающих типа xml. Список к обсуждению долгожителям. 3.Желательно поддерживать не только кросс компиляцию, но и родную с помощью tinyc (ktcc). По моему proposal видно, что я собираюсь сделать обертки для большого числа библиотек, имеющихся для KolibriOS, не только тех, что имеются в составе дистрибутива. По окончанию работы над первыми 2 пунктами, займусь этими. 4.Я бы предложил стандартизовать fastcall соглашение для оберток. I think it would be better to make inline functions. My experience in Porting Netsurf says that we should have a function free_asm() which is callable from C and let's you free memory block allocated with MCALL 68,12 . Basically, free_asm() should be wrapper on top of MCALL 68,13 . This is because if use libc's free() on memory block allocated from MCALL 68,12 from the heap, free() crashes . It is NOT a bug in free because free() expects that the block was allocated using malloc() . Btw, shouldn't our malloc() implementation be based on mcall 68,12 and free() based on 68,13 so that everything remains the same in C as it is in assembly? System function allocates 4K blocks. My malloc realization uses sysfunc directly... It is very irrationally. So there is a need in memory manager. But I think newlib and menuetlibc already use it. Last edited by Albom on Wed Apr 27, 2016 12:59 am, edited 1 time in total. 2.kttc fails (crashes) with inlining today. ashmew2, in newlib just call user_free(). It's sysfn 68.13.
maybe need ports new version? -in manual with 0.9.23 states: inline keyword is ignored. and after removing all inline keyword problem is gone. Maybe new version fixed this maybe not. I've seen some versions @github and @home tinyc site. Later do comparing. Last edited by Siemargl on Thu May 12, 2016 1:21 am, edited 1 time in total. The primary goal is to write a wrapper libraries, and toolchain from Serge, then the completion newlib if necessary (support for all system calls) .It plans in the first half, in the second half, it will be possible to do ktcc, and compiling them all of this, right under KoibrioS. Some errors gone, but still need work for native kos compiler executable (just runs, no result). Sorry, it works (but silently). I prepare to run internal tests, check some incompatibilities in source code parsing and check its mini libc. 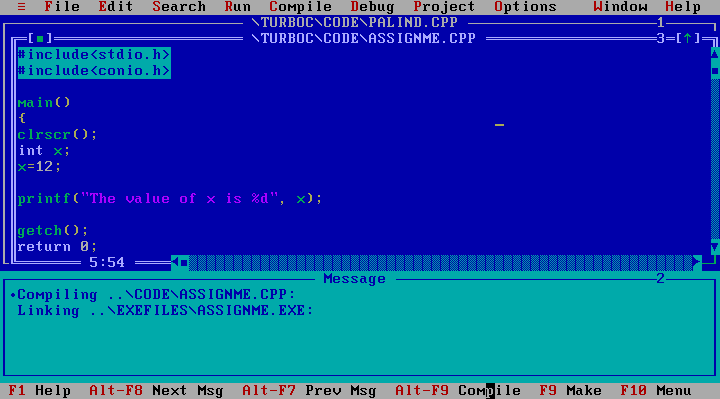 The name conio.h reminds me of the first C Compiler I used, BORLAND TURBO C.
OK. I would like to see results as soon as possible.